This photo of a fall foliage leaf was taken on a hike through the beautiful White Mountains of New Hampshire. I took the photo as I found it and it conveys both, a feeling of calmness and an impression of movement. 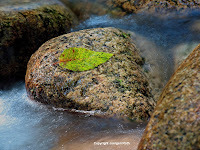 The fragile structure of the leaf is in beautiful contrast with the floating water and the wet rocks. 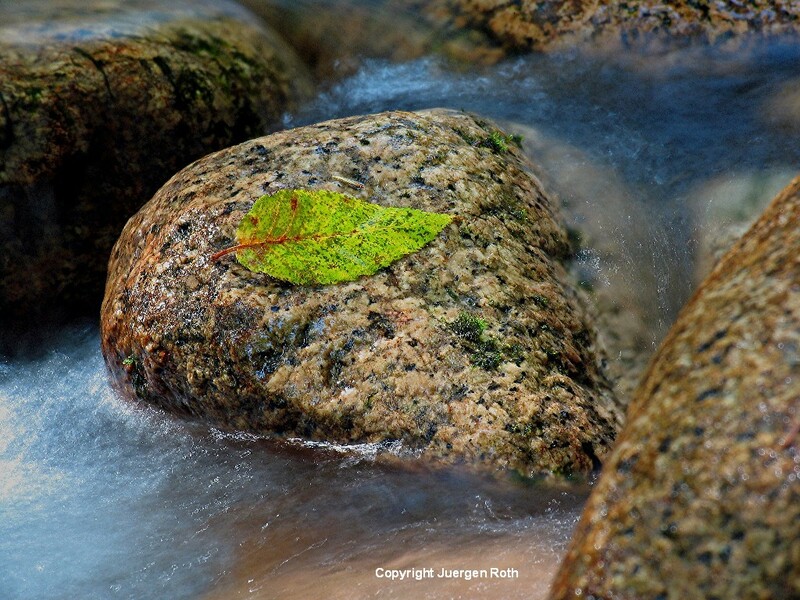 The Polarizing Filter saturated colors and minimized glare on the leaf and surrounding rocks. The filter also extended the exposure time which was desired to produce the Silky Water Effect in the brook that indicates the movement of the floating water. I placed the brook, rock and leaf near or on the diagonal of the frame to create more emotion in the composition. An aperture of f/8 provided plenty of Depth of Field and combined with an ISO50 setting created a desired slow shutter speed of 1/2 second that allowed for the velvety water effect. During post processing I removed dust spots, minimally adjusted lighting, contrast and color saturation before sharpening the final picture of this nature setting.